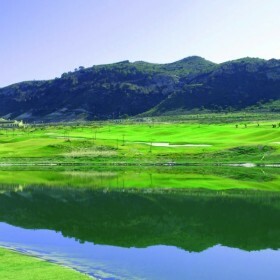 The splendid views from the course, which blends into the area’s scenery in a gental and natural way, a small river that inter-connects five ponds and the layout of its fairways make for a technical game of golf that invites the player to use all his golf clubs. What a pleasant surprise this was – this is a very, very good golf course – fairways and greens excellent just needs a little bit of maturity on the edges of this course. Very undulating set on the side of a small mountain making you have to think about your shots even if on the fairway as the ball can be above or below your feet. 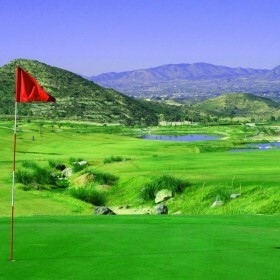 Is totally unlike any other course on the Costa Blanca in that you have areas of thick rough not far off the fairway which is a real treat – but just watch out for snakes (we saw a four footer when we played!). Very scenic and quiet (no houses) – converted Finca as your clubhouse and the bilingual staff were very friendly and accommodating. Stay on the terrace and enjoy well priced food and drink as the sun goes down. Great Price for the early birds who enjoy walking!